WOTOFO Sapor RTA 25 is a 3.5ml capacity 25mm diameter rebuildable tank atomizer, features dual adjustable top air flow, two post rebuildable deck and gold plated 510 Contact pin. Wotofo Sapor RTA is a top airflow rebuildable tank features 3.5ml ejuice capacity. different with the wotofo older line of tanks and drippers, Sapor RTA 25 updated the size of diameter to 25mm, and comes with various features and new designs, such as dual adjustable top air flow, adjustable wicking holes, two post rebuildable deck, dual terminal per post, redirects down into build chamber, gold plated 510 Contact pin and so on... WOTOFO Sapor RTA 25 Atomizer is easy to compatible with most 510 Thread e-cigarettes box mod and not easy to leak, it will always give you large vapor experience. 8. Set the juice fill cap and open the air hole. Make the dot markers on the tube against the other dot mark on the base and enjoy your vapor. 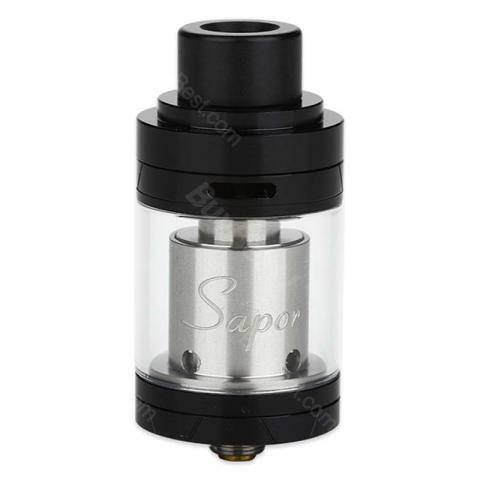 WOTOFO Sapor RTA 25 Atomizer - 3.5ml is very good, also not expensive. Die E-Zigarette Sapor bietet ein hochwertiges / kostengünstige Möglichkeit, um mit dem Rauchen aufzuhören.